Premis's Pictogram "Running Man" LED Exit Sign Emergency Combo is the 2 in 1 solution that addresses the change released by the National Building Code of Canada (NBC) in late 2010 requiring the need to use letters and chevrons with a pictogram (and directional arrow where needed) to replace traditional EXIT/SORTIE signs with the added combination of LED emergency lam heads. 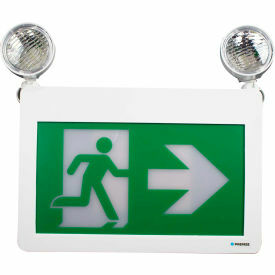 LED Running Man Exit Sign is constructed from durable corrosion and flame resistant thermoplastic. Powered with long life LED chips, they are the perfect choice for both new and retrofit projects.